Recently received a question from Mark, New Orleans LA which runs like this. Do you sell these french drip coffee makers? If not, do you know where I may find one? At first I thought it was a little odd. Didn’t he mean French Press or Drip coffee makers? How could a French Press drip coffee? But as you see from the picture, it really is a drip coffee maker. 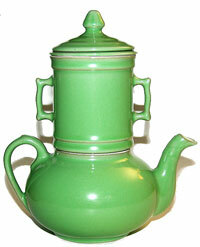 Typically found in the Southern states, a French drip coffee pot is traditionally a teardrop shaped coffee pot. French Drip Type Makers are sometimes as elegant as this one. I first learned about a French Drip Coffee Maker when I lost power in my house and so was forced to make coffee on an old fashioned, gas stove. I found that this old drink that I tolerated for so long, was now my favorite drink in the house! Cooking on an old fashioned stove percolator was so superior to my standard coffee pot, that I instantly went online to begin searching for tips to enjoy better coffee. The journey began. First I went searching on review sites, then on forums, then on e-commerce sites to look at every kind of coffee product available, and after this very long search I found EVERYONE saying one thing — You MUST get a French Drip Coffee maker to truly enjoy coffee. I’m not sure why I was surprised, maybe because my parents were always standard, non-French coffee drinkers, but when I first got that French Drip Coffee Maker off of Amazon, I was in seventh heaven. I suddenly wanted coffee in the morning, the afternoon, and at night too! This boring drink that I tried to make taste good with sugar, suddenly didn’t need sugar anymore! Suddenly I could enjoy it by itself! It was amazing! I would strongly recommend someone to try this great form of coffee. But I also have a warning: Once you go old fashioned, French Drip, you don’t go back. You won’t enjoy the burnt, bland, and offensive coffee that normal Americans have been duped into drinking. You will want the exquisite, rich, detailed flavor that only a true French Drip can provide. And you will find yourself suddenly looking at coffee time as something enjoyable and centering, like a nice walk through the park with your Lab. Purchasing a second hand one seems to be a little easier than buying a new one. Ebay has a few for sale right now. But I’m not sure that any of those is as romantically designed as the 19th century models. And there’s this one at Etsy.com, that’s made in France. I looked on Amazon.fr to see if there were any models new for sale. But I haven’t seen anything remotely similar. It seems the French are more practical these days, preferring the convenience of electricity. For more reading on this type of coffee maker, why don’t you check out the article written by Chris & Betty Zeigler called Discovering French Drip Coffee.